Creative ways to Use Wall Slicks wall decals stickers to accent your home decor.Tips on using and combining colors. This section has lots of great ideas for transforming everyday items into designer looks with Wall Slicks. Much cheaper than buying matching designer accessories. Lay graphic on cardboard or paper and frame it! This is a great way to create unity in design by repeating the same pattern in several places around a room. 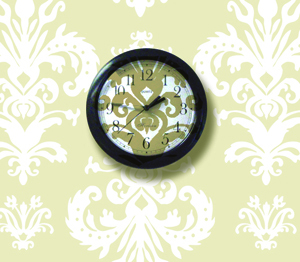 One pack of decals, such as the Damask wall decals shown here, provides enough decals for you to express yourself in many ways. 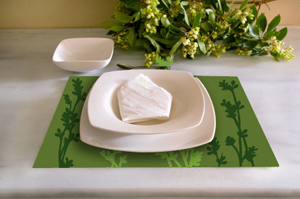 Put decals on plain color plastic placemats to spruce them up! Look at how much beauty is added to a simple $1 piece of plastic! This allows you to save money on decorative elements, and still have the design of the whole room tie into together. Use on clear things, like sliding glass doors or windows, for safety and privacy. The beauty is a bonus! Look at what we did here instead of a dusty curtain. You still get light in, but obscure the view in. 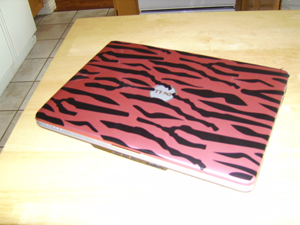 Another IDEA: Get this look but use our "Frost" vinyl! Use on plain items around the house, to spruce them up and coordinate your room. Don't run around town trying to find the perfect accents! 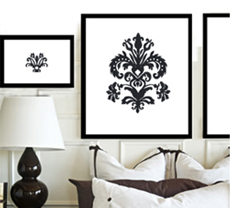 Use the same decals that you decorate your walls with, for all of the other elements in your room! And chances are, you will save time and money! 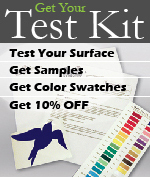 Decorate your electronics, phones and more. 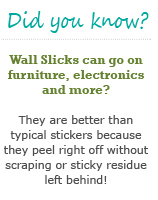 Wall Slicks are better than regular stickers because they come clean off without scraping or residue. Find more on our blog!